PACE members approved amendments filed by the Ukrainian delegation. The Parliamentary Assembly of the Council of Europe has passed a resolution acknowledging the occupation of certain parts of Ukraine's Luhansk and Donetsk regions by the Russian Federation, according to the UNN news agency. In particular, Amendment 19 to the resolution entitled "State of emergency: proportionality issues concerning derogations under Article 15 of the European Convention on Human Rights" reads replaces the words "non government-controlled areas" with the following words: "temporarily occupied territories in Donetsk and Luhansk regions controlled by the Russian occupation administration". According to MO Oleksiy Honcharenko, a member of the Ukrainian delegation to the PACE, this amendment was approved as well as Amendment 18 saying "make further efforts to enhance material conditions for people in Donetsk and Luhansk regions using the crossing points between government-controlled territories and temporarily occupied territories controlled by the Russian occupation administration". The head of the Ukrainian delegation to the PACE, MP Volodymyr Aryev, called the adoption of these amendments a "victory". "Enough with the fairy tales about miners and tractor drivers [shopping] in military depots in international documents," he said on Facebook. In January, the PACE adopted a resolution on humanitarian implications of the Russian war against Ukraine. 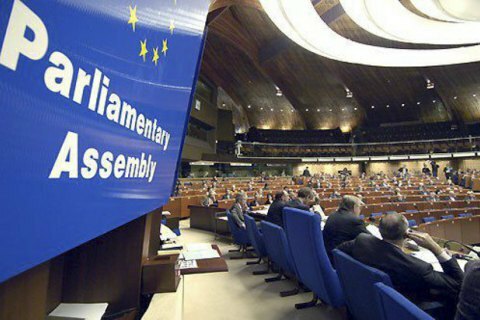 On 23 April, the PACE decided against discussing the illegal Russian presidential election in annexed Crimea. Who is going to win the presidential election and what it may cost Ukraine?